Get on the right track with this black plaid 3 piece suit with the 1920s lapel vest by Vinci. The style just screams classy and you'll love the way you present yourself wearing it. This black plaid 3 piece suit isn't your boring style suit because it has that window pane plaid pattern that people will notice fast. 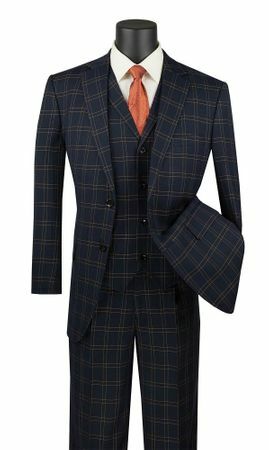 It has a 1920s style lapel vest that really sets this suit apart. The pants single pleat style and ready for hemming. The jacket has side vents in the back all in a regular fit. Made of fine poly/rayon with a luxurious fine wool feel.